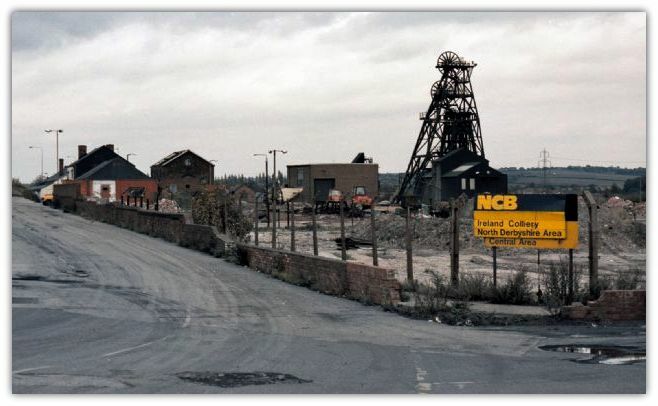 Ireland colliery (North Derbyshire) sunk 1874-1876 to 364 yards (333m) by the Staveley Coal and Iron Co at Staveley was closed after 112 years and merged with Markham in October 1986 (re-named and called Markham No5). Threequarter, First Piper worked by drifting from Deep Hard 1968 - (inc Markham). The maximum output was 656,900 tonnes in 1981/82 produced by 784 men. The maximum manpower was 1,323 in 1948 when 428,463 tons was produced. Around 27 million tons of coal was produced from the Deep Soft seam. Position E443686 N374178. A single shaft was sunk, the first sod turned on 10th June 1874, the Deep Soft reached on 26th January 1876. The foreman sinker was a Mr Ireland! Another possible reason for the name of the colliery is that during the reign of Edward I (1272-1307) this part of the manor of Staveley was held by John de Hibernia and in order to preserve links with the past the colliery was given the English version of his name – Ireland. A roadway was driven from nearby Hartington colliery to form a ventilation circuit, which was now required by law. There were 91 known old shafts in the area, plus some ancient Bell pits and the Deep Soft was known to have been worked at Handley colliery North of Staveley in 1830. During the reign of William IV (1830-1837) Tom Lane pit off Inkersall Road approx position E443200 N372100, was working. Seymour (South of Woodthorpe village). The largest vertical cylinder marine type winding engine at the time capable of 1,000 tons of coal per shift from 1877 was installed at the shaft, when the first coal was raised and remained in service until 1963. 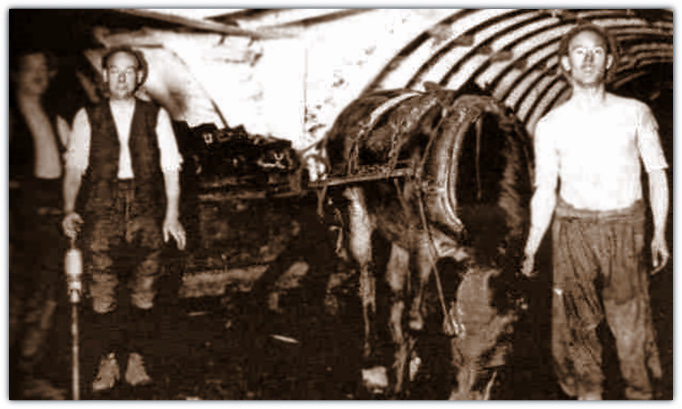 Pit ponies were used underground for coal and supplies haulage. The last 5 were brought out of the pit in the spring of 1970, and the last ones in Derbyshire were released from their drudgery at Shirebrook later in 1970. In 1935 Davis-Hunter electric lamps were clipped to the ponies’ collars to afford them some light whilst they travelled the roadways, as they usually did so in pitch darkness. Ventilation in the early days at the pit was by a furnace at the bottom of Hartington shaft. A new 200hp diesel operated exhaust fan powered by creosote from Staveley Works was installed in 1877. Old fashioned hand filling methods continued until the 1920s when shaker pans were installed at the coal face. These were later replaced by rubber conveyors. In the mid 1940s towards the end of the Second World War some American lease-lend mining equipment was installed, with USA manufactured track-mounted arc-shearers with gathering arm loaders and shuttle cars and rubber conveyors. 3 shift mining was introduced and advances up to 100 yards (91m) were obtained, and 27 men and 3 officials produced about 4,000 tons per week into the 1950s along with a further system introduced in the early 1950s in the Deep Hard seam when 110 yards (100m) single-unit panels were established, and a team of colliers cleared the face line of coal, dismantled and re-erected the face conveyor, undercut the coal and packed and drew off the powered face supports, ready for the next shift. It was referred to locally as ‘Kick and Rush’ and one can see why. A Joy continuous miner was working in 1958 and the first Anderton shearer cutter loader was introduced in Aug 1960. In the Deep Hard seam quaint roadway names such as Middlecroft Plane, Return and 2nd Intake, Netherthorpe Plane, Return and 2nd Intake, Campbell Plane and Intake. 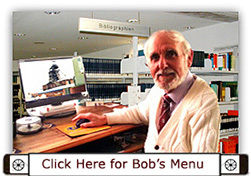 The Surveyor John Banks amended the abandonment plan to show roadways driven after 7/10/1972 up to 30/9/1986. Hartington Deep Hard was abandoned Oct 1923. The Hartington UC shaft to the Deep Soft horizon was used for ventilation, manriding and pumping. The Deep Soft roadways from the UC shaft as far as the drifts to the Deep Hard used for ventilation and travelling. Since the abandonment of the Deep Hard, headings for the 1st Piper seam started in Sep 1980 and finished Dec 1982. Water in the gulley was blocked. From Feb 1977 it was inaccessible so the water was diverted to flow down the middle gate of three driven through the Staveley Works pillar. In Feb 1979 the flow of the water was partially re-established onto its original course until Apr 1986 when the roadway was undermined by workings in the Piper seam. The water then ceased to flow down Campbell Plane and Campbell 2nd Intake.